I’m coming up on my first anniversary as a Reiki Master next month. With a houseful of small children, and an overworked, stay-home partner, I’ve had plenty of opportunity to stay in practice, from winding babies to healing backaches to clearing negative or chaotic energy, not to mention self-healing that helps me to be more open and present where I’m needed most. Being, as they say, a certain age, I admit it took me long enough to get this far on my own spiritual journey, considering that from youth I felt, no, I knew there was something more to life than what I was learning in school, weekdays or Sundays. On several occasions I was even whupped up the side of the head by it, usually through friends who were in tune with this something more. But I was “stuck”. I wanted to connect, but for a long time it just never seemed like it was going to happen for me. I was full of doubt and my life was full of many of the distractions available to me in modern times. That was then. Daily I feel Reiki flow through me and out to others. I meditate, clear out and exercise my chakras, and have even gone deep beyond the casual flirtation I used to enjoy with my tarot cards. But old habits die hard. Self-doubt was a part of my makeup far too long to go without a fight. Oh, it’s fairly well subdued these days, but it does occasionally like to let me know it’s still around, just in case. Yesterday I was sitting in the car, waiting for my partner’s mother to come out of the house, having a quiet moment to myself during an otherwise busy day. I suddenly heard a voice behind me, from the back seat. It was doubt. Out of consideration, he decided to stop by not to criticize or attack me – he knows that would just raise my defences. So instead, he gently offered a few “what ifs”. I stared out the windscreen, half listening, emotionally detached from doubt’s monologue as he prattled on. 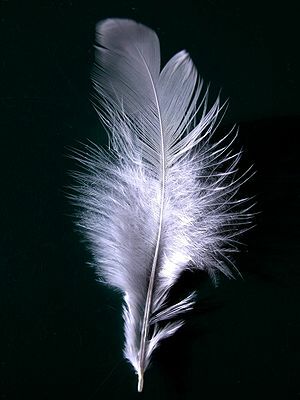 And as I did so, I saw the tiniest, pure-white feather drift slowly down out of nowhere from a seemingly empty winter sky, landing on the pavement in front of me. I got out of the car and examined the feather. I knew how it got there, why it was there, and what it meant. Feeling grateful and slightly awed, I picked up the feather and got back in the car. Doubt now knew that I wasn’t paying any attention, so he stopped talking and got out.